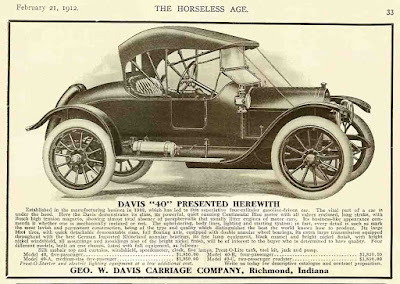 George W. Davis was a well established buggy wagon builder when he established the George W. Davis Motor Car Company in 1908 and his first cars were simply motorized buggies. The Davis became a 35 hp four-cylinder motor car in 1911 and was offered in touring and five-passenger torpedo styles. A six-cylinder model was also introduced in 1914. From 1916 only six-cylinder models were offered until 1927 when an eight-cylinder model appeared. The cars were successful with good sales in America and overseas. 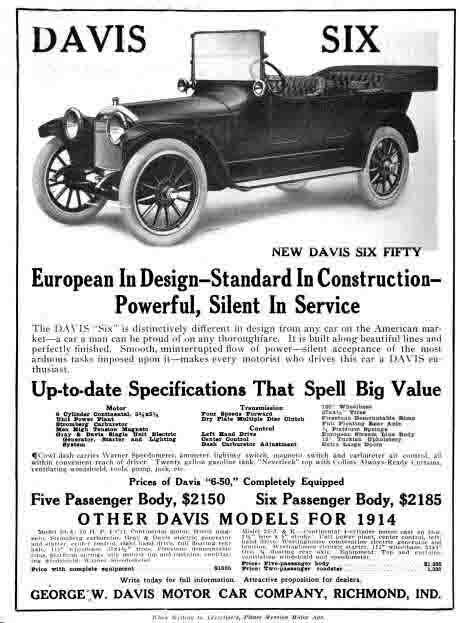 The Davis was a well built assembled car offered in a wide range of body styles and attractive two-tone paint schemes. After 1920 the Davis began to lose its market position and sales began to suffer. In February 1928 the company was taken over by the Automotive Corporation of America but only a few cars were made that year before production ceased. The first Davis motor buggies are unlikely to have carried an emblem but may have had a small maker's nameplate/serial plate. 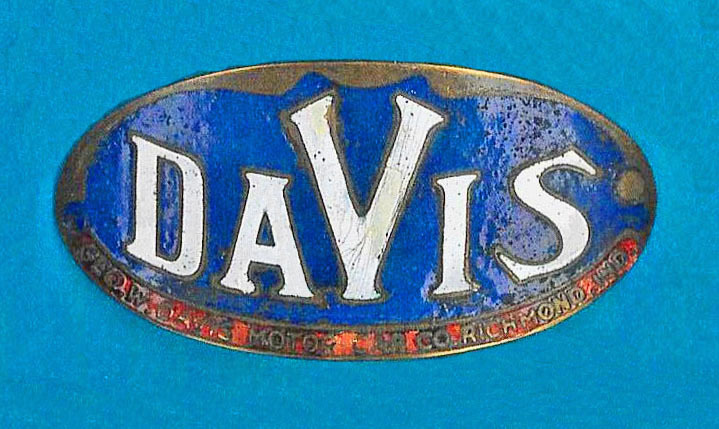 The first Davis cars in 1911 had a blue and white radiator emblem, see example below. This Davis radiator emblem is extremely rare. The Davis radiator emblem design was changed in about 1914 to include a red ribbon along the bottom of the emblem showing the company name and location, see example below. This particular Davis radiator emblem is unusual and extremely rare. The more usual Davis radiator emblem with this design uses a thicker metal base, is domed but was made to fit onto a flat radiator. It can be found in plain metal or plated, see example below. 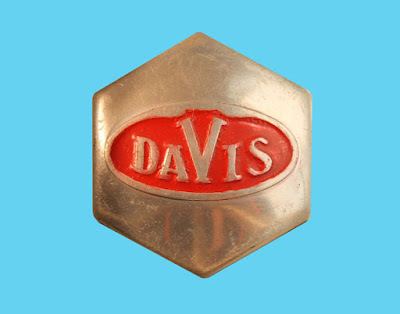 This Davis radiator emblem is rare and may have been used on flat radiator models at the same time as the curved radiator emblem described earlier or shortly thereafter. This Davis radiator emblem continued in use until 1925. Beware, as there is a Pulfer reproduction of this Davis radiator emblem, which is flat rather than domed, has no maker's mark and has a bright orange-red band at the bottom. 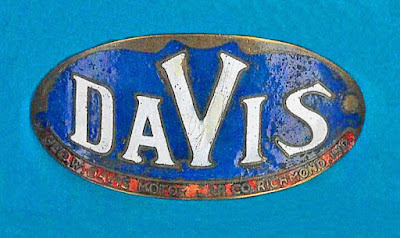 In 1926 the Davis radiator emblem design was changed to a domed, plated metal emblem with the Davis name finished in blue enamel, see example above at the top of this post. This Davis radiator was used until Davis production ceased in 1928. Relatively few Davis cars were built using this emblem and most examples of this emblem appear to be unused new-old stock emblems. This Davis radiator emblem is scarce.